This bath remodel began with the flooring, and then the shower tile. 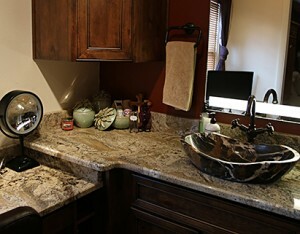 Then adding the various elements such as choosing the cabinets and choice of granite stone. Be sure to take samples when you go to choose. Find the one piece you can’t live without, the Flooring, Cabinets or Stone, then begin building around those features. After the tile was chosen for the floor and shower, then the cabinets were chosen. The first cabinets chosen, the client decided the price was a little steep for the a bath. So, they chose a comparable color and feel with Crown Cabinet line, Big Creek, Knotty Alder with a finish of Latte. 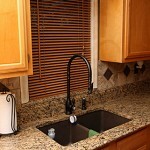 With the cost savings they were able to add in the drawer and door soft closes. Then the door samples and flooring samples were taken to the HMKS Slab Yard, to choose the granite of choice Netuno Bordeaux. 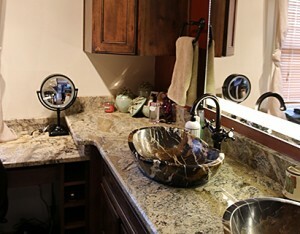 Stone sinks were added and bronze faucets to tie in the colors of choice. Then a wall of color was added to add depth and rich color to the bath. Then the final mirror was chosen with illuminated frame with a dimmer switch and motion detection. No more stumbling around at night.